Now here’s a challenge. We’ve been commissioned to build a deck 5.5m high on the lowest point. The highest point is about 7m off the ground. An engineer and architect have drawn plans and there is a strict spec we need to follow. Our H4 CCA treated gum poles are 9m in length. That’s too long to fit on the top of our vehicles so we have to have them delivered. There are to be 3 of these poles in the front length of the deck measuring 6m long and another 2 mid way across the width of the deck. Each pole is to be buried in the ground in a hole measuring 1m deep to the lowest point and 600mm x 600mm wide. 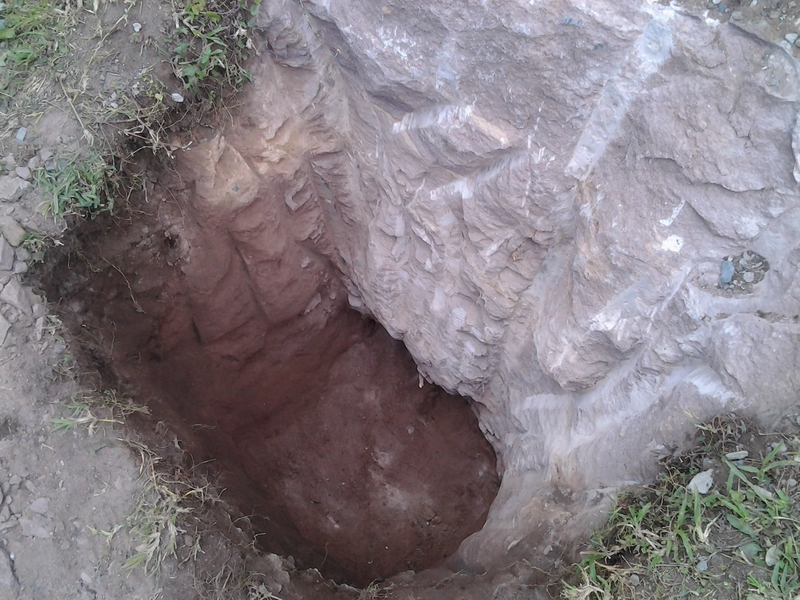 The two end holes were dug with ease but the middle hole was slap bang in the middle of a rock. So we hired breakers, pulled the generator out and started digging. We dug straight through the middle of the rock. It was only sand stone so went relatively easily, but let me assure you even sand stone is hard enough to test the best of one’s fitness when holding a breaker whilst standing in the hole and still having to remove what you have just broken out the hole. 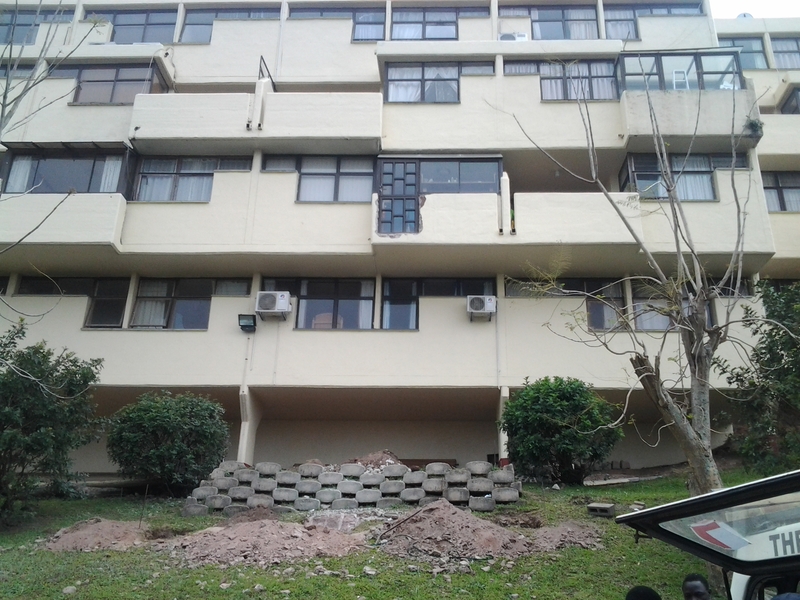 We will finish on nearly two cubic metres of sand and 2 cubic metres of stone and 14 bags of cement. We’re mixing a wet mix as opposed to our normal dry mix. Each pole is being placed in the hole and secured using 38 x 114 (our joist material) in 6m lengths attached to the post and secured to the ground by digging them in and placing bricks around them. 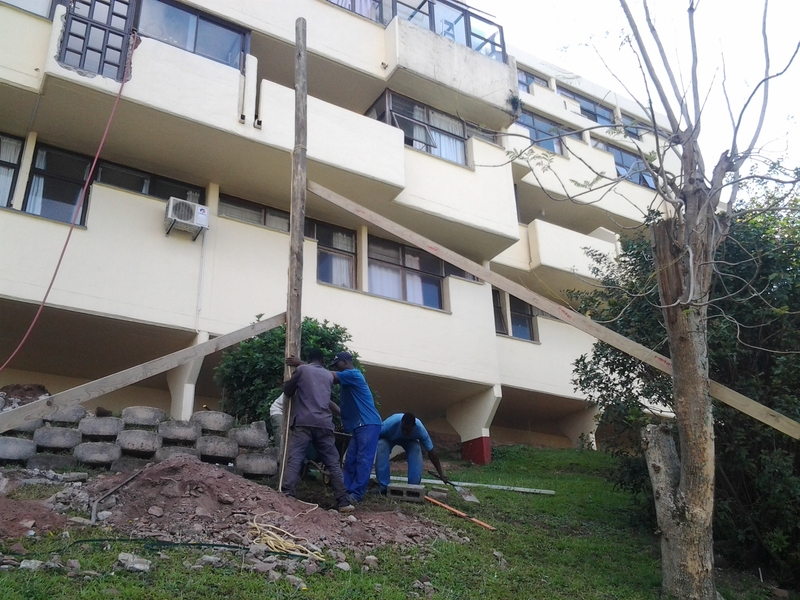 We’ve managed to find a few trees nearby so have used the rope that was used to pull the pole up to tie it off to a tree to secure it while the concrete sets. We had a little set back in that the deck was to be originally 6m x 2m. However our main beam, and therefore posts below would have ended up on the ridge of the retaining wall you see in the pics. We therefore had to extend the front edge of the deck by 1m. 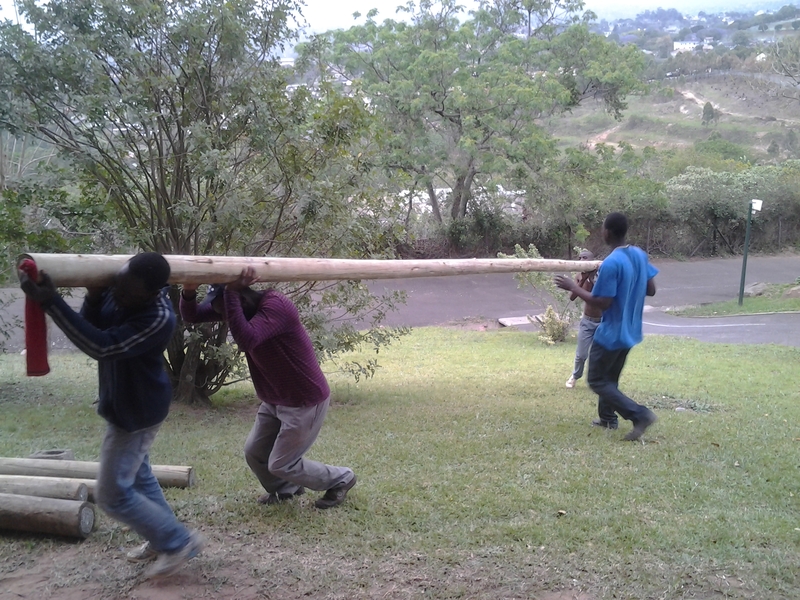 As a result the original poles we bought are too short by about 300mm. We originally bought 7.2m poles but have now had to go up to 9m poles. Once we’re up with the poles we will need to build a platform of sorts so that we can work at waist height to build our substructure. Or we may opt for scaffolding. Once that is up we can then lay our deck boards and build our balustrade with ease and safely. I’ll post some more pics here of the completed job and work in progress. It’s a daunting task because of the height and we need to ensure that we are working safely and that the budget doesn’t run away from us. It is easy to lose money on a job of this nature due to extra costs. Already we have had breaker hire for 3 days, one of which I managed to re-coup from the contractor breaking the hole in the wall to install the door. He didn’t realise that the balcony wall was solid concrete. He was probably expecting brick and sent his crew with a four pound hammer. Poles have grown in length and of course cost more. Holes have ended up bigger than planned so more money has been spent on sand and stone and cement. For a free no obligation quote on your outdoor wooden decks, pergolas, balustrades, walkways etc. contact us on 031 – 762 1795 or use the form below. This entry was posted in Durban, Wooden Deck Builder Durban, Wooden Decks and tagged Construction, Construction and Maintenance, deck, Decking, Sundeck, Sundecks Durban, timber, wood, wooden, Wooden Decks by Garrick Dunstan. Bookmark the permalink.